About YPPedia · Browse · Help · Categories · All Pages · New Pages · Y!PP Merchandise! 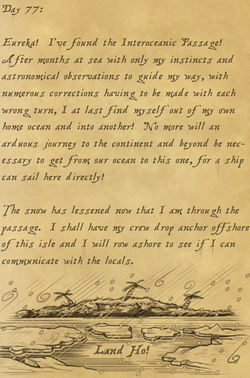 Starting in January 2012, six oceans in the Puzzle Pirates world merged into three, with each new ocean comprising two former oceans. The merged oceans are named Cerulean, Emerald, and Meridian. Within each merged ocean, the geographies of the two former oceans are stitched together, side-by-side. Cobalt and Midnight merged to form Cerulean. Sage and Hunter merged to form Emerald. Malachite and Viridian merged to form Meridian. One of each pair of oceans is designated "West" and the other is designated "East". Pirates, crews, and flags were renamed with the suffix "-West" or "-East" if the same name existed on both merged oceans. The mergers of the English-language oceans were hinted at on December 7, 2011, when the "Intrepid Explorer" Velasco Thorsson posted his journals on the "Hear Ye! Announcements" forum. Cerulean was the first ocean to be tested, opening on January 4, 2012. The official merge occurred on January 31, 2012 at 8am Pirate Time. Apr 19-22 (All) Step aboard the Portrait ship! Easter! Will you celebrate on board "covered in eggs" or "of rabbits"
Apr 20 (All) Swordfighting: Blades of Grass	Win an octo! Apr 22 (All) Step aboard the Portrait ship! Earth Day! Celebrate on board "In Full Bloom"
Apr 25 (All) Step aboard the Portrait ship! ANZAC Day! Remember the sacrifices made by others on "Lest We Forget"
Apr 30 (All) Competition: All Land Puzzles! Win an octo! May 04 (All) Step aboard the Portrait ship! Star Wars Day! Will you be"feeling the fourth"
May 20 (All) Step aboard the Portrait ship! World Bee Day! "To Bee or Not To Bee" that is the question! May 25 (All) Step aboard the Portrait ship! Towel Day! "Don't Panic" the answer is "Forty Two"
May 27 (All) Step aboard the Portrait ship! Memorial Day! Contemplate on board"Always Remembered"
Jun 04 (All) Step aboard the Portrait ship! Hug a Cat Day! Hug a floof on board the fine vessels "of cats"
Jun 08 (All) Step aboard the Portrait ship! World Oceans Day! 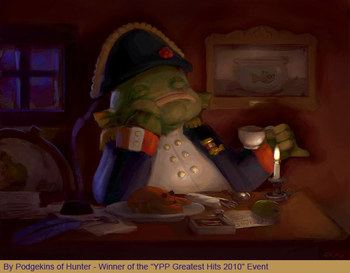 Will you be "sailing the salty seas"
Jun 15 (All) Step aboard the Portrait ship! Global Wind Day! Batten down the hatches while "braced against the wind"
Jun 25 (All) Step aboard the Portrait ship! Day of the Seafarer! Here we are, "anchored in tradition"
Unofficial Events have no affiliation with Grey Havens in any way. Apr 5 (All) People's Choice 2019!Vote For Your Favorite Non-Winning Egg Design! This page was last modified on 8 January 2018, at 18:00.